The story of the Fairway Trolley in Red Hook is one of a dream unfulfilled. 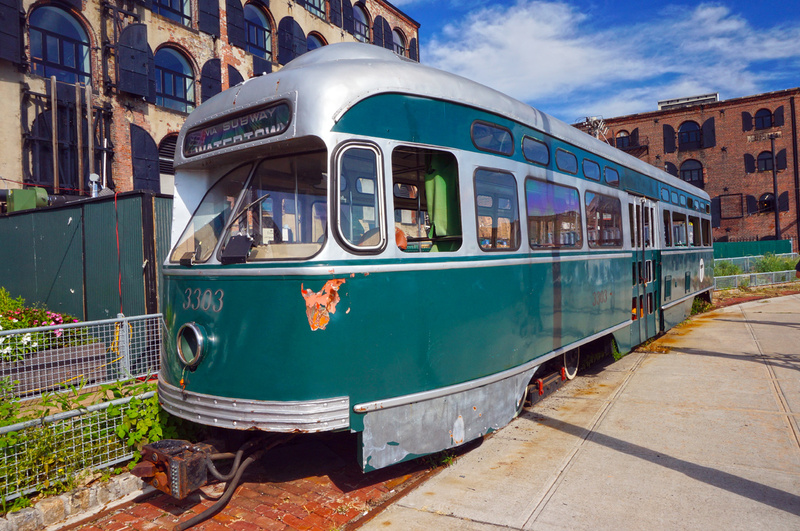 Transit buff Bob Diamond dreamt of reviving part of Red Hook’s trolley line. He and friend Gregory Costillo founded the Brooklyn Historic Railway Association (BHRA). Then, they purchased trolleys, equipment and parts with the plan of renewing trolley service from Red Hook to Atlantic Avenue and Downtown Brooklyn. Diamond and the BHRA worked with the New York City DOT during the 1990s and early 2000s to make the dream a reality. The stable of 17 trolleys owned by the BHRA included a maintenance vehicle and fifteen PCC street cars from the 1930’s, as well as one antique trolley from Norway built in 1897. 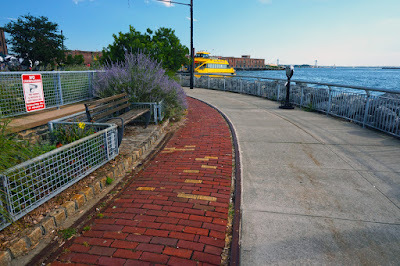 The BHRA installed a one-mile loop of tracks beginning from the waterfront property of local developer and preservation supporter Greg O’Connell. BHRA tracks extended west from their warehouse along the esplanade before transitioning to city streets. The tracks ran along Conover, Reed and Van Brunt Streets. Unfortunately, the BHRA never made it to their final destination in Downtown Brooklyn. Constructed of wood, the antique Norwegian trolley was built by Schuckert & Co. in Nurnberg Germany. 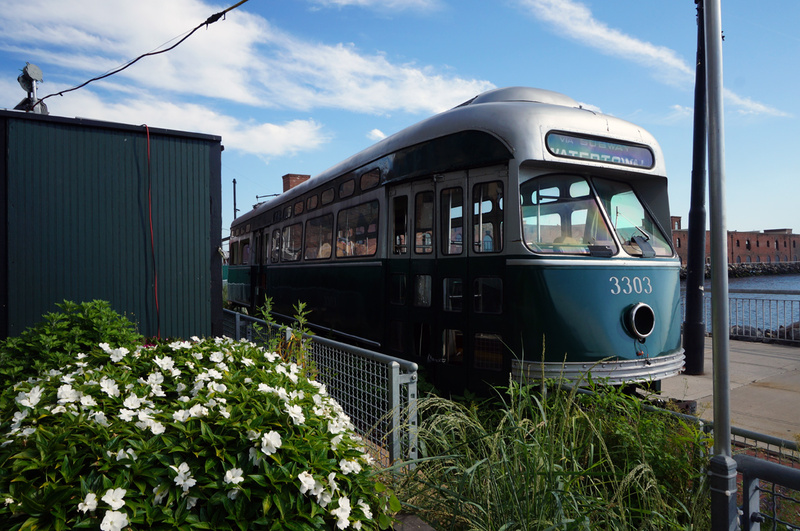 The “streamlined PCC cars” were made in America and introduced to New York in 1936 as a final attempt to prevent the electric trolley’s elimination by the city. However, mayor LaGuardia was unsupportive of continued trolley service and the effort failed. The city’s street cars were eventually phased out in favor of buses. Former head of the BHRA, Bob Diamond is an electrical engineer who is also known for rediscovering the ca. 1844 Atlantic Avenue LIRR tunnel when he was an 18 year old. During his time with the BHRA, he purchased and installed signals, catenary poles, tracks and other equipment. In addition, he worked to secure grants, organized trolley related events and spent a lot of time advocating for renewed trolley service. 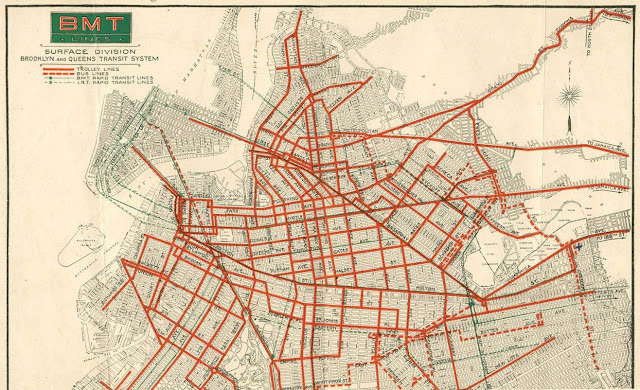 The neighborhood’s access to greater Brooklyn has been limited for a long time. Red Hook trolley service was replaced by municipal buses ca. 1950. Later in the 1950s, the neighborhood was cut off from the rest of Brooklyn by Robert Moses’s BQE. One of the BHRA’s goals was to bridge the transportation gap between Red Hook and neighboring communities. Ultimately, the City DOT determined that there were better ways to alleviate Red Hook’s transportation woes than by renewing trolley service. A DOT study determined that the neighborhood’s roads were too narrow and would require the elimination of on street parking in places to make room for the street car’s wide turns. In addition, the report stated that “trolleys pose a risk to cyclists”. “The study made a recommendation not to implement a streetcar system in this area due to cost, land-use considerations and impacts on the street network”. In a Curbed article Bob Diamond claimed that Mayor Bloomberg killed the project on his second day in office. Whether the study’s recommendations or the changing priorities of a new administration are to blame is unclear but city support for the trolley project ended in 2003, not long into Mayor Bloomberg’s tenure. After municipal support for the trolley project was terminated, Mr. Diamond was required to find outside financial backing. Making things worse, there were disputes between him and other volunteers and he was evicted from the warehouse where the BHRA had operated rent free for more than ten years. In 2004, when Diamond could not secure funding from other sources in time, tracks that had been constructed in the city right-of-way were removed and the streets repaved. Four trolleys remained in Red Hook for over a decade. Three sat on tracks behind Fairway and were damaged from flooding caused by Hurricane Sandy. The corrosive salt water accelerated the trolley’s decay, raising fears that restoration would become too cost prohibitive. So, in 2014 they were transferred, albeit without Bob Diamond’s consent, along with a “significant donation” to the Branford Electric Railway Association to facilitate their acquisition by others for potential restoration. The organization operates the Shore Line Trolley Museum in East Haven CT. The last remaining trolley sat in a nearby warehouse until it was moved to the tracks behind Fairway where the other three trolleys once were and where it remains to this day.